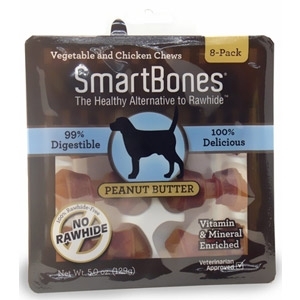 SmartBones Mini Peanut Butter Chews are made with real chicken and provide the chewing exercise of a rawhide without the risks. Veterinarians have been apprehensive in endorsing rawhide because of potential choking hazards and concerns over digestibility. However, SmartBones are 99% digestible and 100% delicious. Tests show 9 out of 10 dogs prefer SmartBones over leading rawhide chews and these chews are fortified with vitamins and minerals. Feauring a peanut butter flavor dogs love. Minis are ideal for small dog breeds (under 10 lbs).